Christmas in July STARTS NOW!! You've been patiently waiting and now IT'S TIME! But before you run to checkout, be sure to take a look at my newest NUGGET upgrade - a 4 in 1 set where you can add YOUR name to the "from" nugget OR use the blank wrapper sheet to make your own personalized Christmas Greetings! Instructions are included for adding text using either Word or Adobe Reader - it's so easy, you'll love the new versatility! Another new printable you won't want to miss is Jody's new Christmas Activity Calendar! 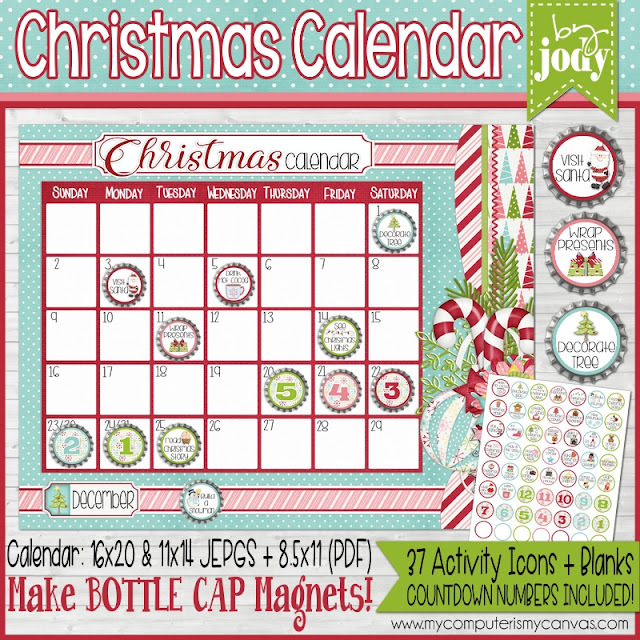 Using bottle cap magnets, you can mark the calendar with December's most common bucket list items like visiting Santa, frosting cookies, wrapping presents, decorating the tree, guests arriving, etc! She also included a set of countdown magnets you can use as well. Such a fun way for the kids to track and see what fun is coming up each week! Finally - you won't want to miss my Box of Nativity JOY! Patterned after my Boxes of Sunshine, Birthday Wishes and Christmas Cheer - you'll love having this collection in your arsenal. 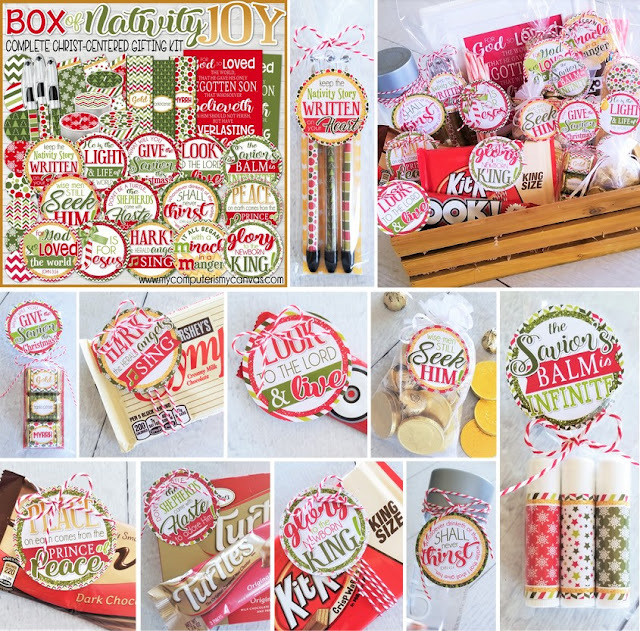 The beauty of these kits is you can use one as a treat, handout or drop-by type gift... or pair a few together to make a small gift OR go all out and create and entire gift basket or care package! The new JOY one, in particular, would be great to send to your favorite missionary! Ok... I won't hold you up any longer - below is the schedule and coupons! or... use BONUS60 anytime during the sale for 60% off any $60+ purchase! and are valid on ALL printables in my shop.